Although the official Gregorian calendar doesn’t mark the beginning of the Fall equinox until September 21, we all know the tell-tale signs: tanned students back from summer break have returned to class, the temperatures are cooling, Labor Day is behind us, and white shoes are no longer seen in public. 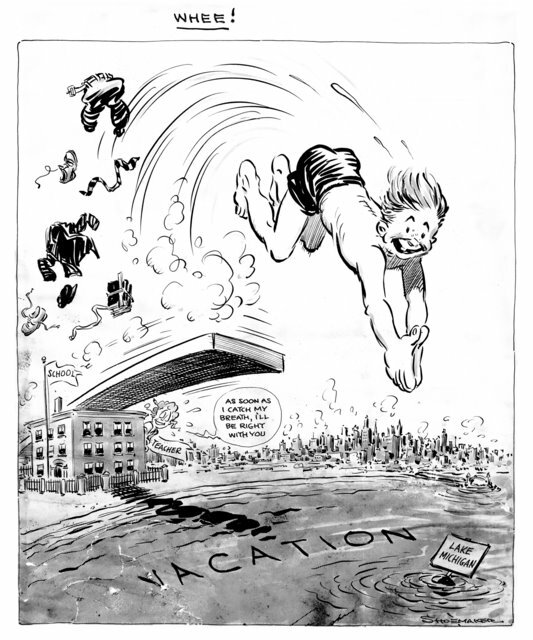 The Wheaton College Special Collections recently acquired an original Vaughn Shoemaker cartoon celebrating the days of summer. After some much needed conservation efforts, the print was scanned and is now housed in the Vaughn Shoemaker Collection. Shoemaker was a Pulitzer Prize-winning editorial cartoonist with the Chicago Daily News for thirty years. He is well-known for his John Q. Public character who depicts the common man. View a video about Shoemaker.